OMEGA “T” Series Connectors are particularly well suited for both three and four wire Pt100 sensors as well as other types of RTD probes and instrumentation where copper-type lead wire is used. OMEGA “T” Connectors are not recommended for use with thermocouples which require connectors with special compensating alloys in their construction. The Series “T” Connector family includes both male (Model TA-M) and female (Model TA-F) in-line connectors, as well as two panel/bulkhead receptacles – one male (Model TB-M), the other female (TB-F). 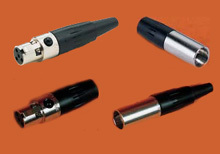 All four items are available in both three or four pin contact construction. A trim plate, Model TYEF-02, is available for the female panel receptacle. Both male and female in-line connectors are offered in two styles: with flexure relief, which accepts up to 2.9 mm cable diameter, or without flexure relief, which accepts up to 4.4 mm cable diameter (add “-L” suffix to model number when ordering). “L” style must be ordered when used with OMEGA’s Retractable Sensor Cable (RSC). Connections are made on all styles by solder terminals.